Make their dreams of gourmet delights come true with this unique and beautifully designed tower of presents, each filled with their favorite chocolates and snacks. Let them unwrap the goodness of Godiva® Milk Chocolate Truffles, The Popcorn Factory® Kettle Popcorn, Cheryls Snickerdoodle Cookies, and more! It will truly make them feel special on their birthday! Make their dreams of gourmet delights come true with this unique and beautifully designed tower of presents, each filled with their favorite chocolates and snacks. 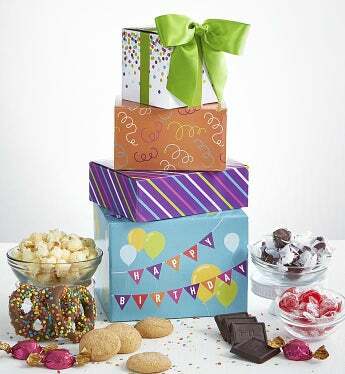 From Godiva® to The Popcorn Factory®, they will love them all! It will truly make them feel special on their birthday!